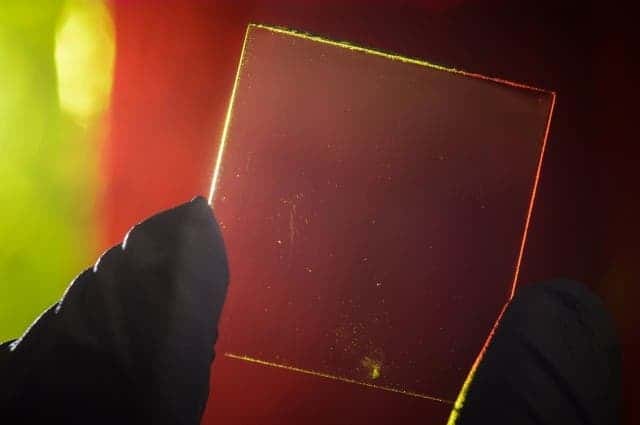 University of Michigan researchers have devised what looks like the world’s first fully transparent solar cell. Think of all of those tall glass buildings; wouldn’t it be nice if all that incoming solar energy was harvested somehow? Likewise, why not let your smartphone charge up a bit while it’s taking a tan. Of course this isn’t a new idea, but previous attempts are rather unattractive because the compromise makes windows too shady or dark. After all, the purpose of a window is to let light in, not make energy. Ideally, you’d want them harness energy as well, complementary. The new system devised at UM is exciting because it offers exactly this: energy generation, with no compromise in visibility. Obviously, windows are transparent because they let most of the incoming light through. This eventually bounces off your retina and allows you to see outside or inside. This is why all those solar cells meant to line windows make them look dark and make rooms inside shady. They have to absorb some of those light frequencies. The researchers at UM took an alternate route. As you can see in these quite impressive photos, their system is fully transparent. 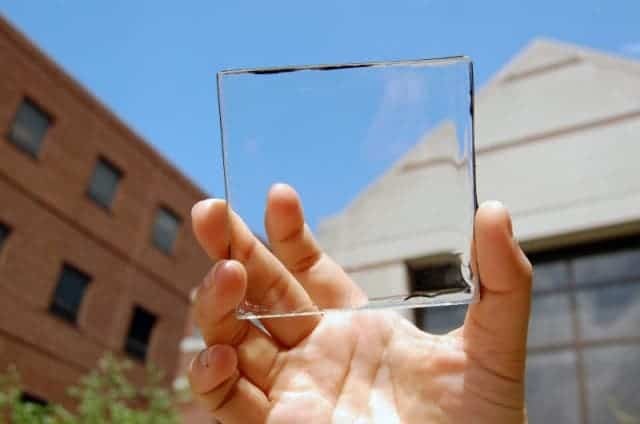 That’s because the glass itself is not a solar cell – it’s a transparent luminescent solar concentrator (TLSC). The TLSC is made of organic salts tuned to only absorb ultra-violet and infrared energy, the kind of light frequencies you can’t see. The salt then luminesce at another infrared frequencies that gets picked up by tiny plastic channels that line the edges of the “glass” and direct the infrared rays to tiny conventional solar cells. As you might have guessed, these score some terrible efficiencies. According to the paper, the TLSC has a rated efficiency of 1%, but the researchers think 5% should be possible. Non-transparent luminescent concentrators (which bathe the room in colorful light) max out at around 7%. Left alone, this doesn’t seem like much, but multiplied by every window in a building this could add up to power the LED lights in rooms, for instance. Definitely, a new awesome fact about solar energy. Keep in mind this is an innovation. Don’t expect it to be efficient or affordable, yet. I do find this kind of research inspiring however. A lot of people seem to be against the idea of solar panels because they’re obtrusive and ugly. Sure, there are pros and cons to solar panels. Personally, I enjoy them, but hey that’s just me. By blending energy generation, solar cells might garner a new following.